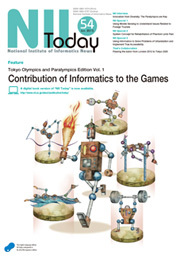 Informatics is a new academic descipline that privides a fuondation to support society. 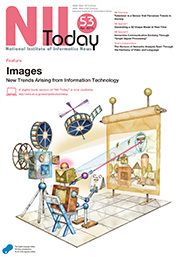 NII Today for the purpose of broadly and simply informing general readers how informatics research changes the society in which we live and what new value it brings to future society. We apologize for putting wrong ISSN number on NII Today Print Versions from 44 to 49. The correct number is ISSN 1883-1974. 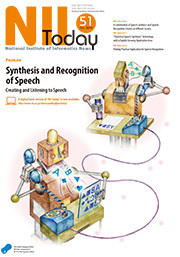 A Combination of Speech Synthesis and Speech Recognition Creates an Affluent Society / “Statistical Speech Synthesis” Technology with a Rapidly Growing Application Area / Finding Practical Application for Speech Recognition / Voice is Conveyed or Voice Conveys ? Can Privacy and the Use and Application of Data Be Compatible? Can a Robot Join an Idobata Kaigi? Can a Robot Get Into the University of Tokyo? The Challenges Faced by the Todai Robot Project / What Impact Will the Todai Robot Project Grand Challenge Have on Society? 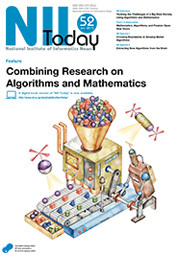 / Solving Mathematics and Physics Entrance Exam Problems with AI Technologies - Current Research and Future Prospects / Social Studies Questions Require Understanding, Not Mere Rote Memorization / The Younger Generation Discusses Their Hopes for the Todai Robot Project / The Experience of "Understanding"
Ultrafast Database Engine will Change Society / The New Principle of "Out-of-Order Execution" Makes it Possible to Increase Data Processing Speeds 1000-Fold / Implementing a new paradigm-changing principle, developed in Japan and promoting the use of big data, into high-speed-data-access infrastructures / Cyber Physical Systems, Creating New Value from Sensor Network Information / Large Scale Health Care Study in Bangladesh, and the Potential for Big Data Use / Expectations Rise for NII Shonan Meeting as a Center of Asian Informatics Research / "The Ordinary and Extraordinary World of Powers"
Academic Cloud Changing the Front Lines of Education and Research / Academic Cloud Gains Momentum with SINET / HPCI and GakuNin join forces to forge a path to the future, with Academic Cloud / Expectations Gathering Around the Linkerof University Clouds; the "Inter-cloud" / Cultivation of Technical Experts Who Forge the Future / Can Social Networking Websites Once Again be Effective during an Ongoing Emergency? An Ongoing Shift to Energy-SavingICT Equipment / Building a Low-Carbon Society with ICT / Demonstration Trial of Smart Gridwith Electric Vehicles / Demonstration Trial Commences with a View toDeveloping Eco-Friendly Supercomputers / Towards Information Open Innovation / The Erdős Numberand the Bacon Number: Who is at theHeart of the Network? Working to Unravel the Secrets of Biological Activity Through Inference / "Meaning" Links Information, Changing the Web / New Data Mining Made Possible by AI / Artificial Intelligence Reasons about the Courses of Trials / Sharing experiences sharing privacy as well? Developing a‘anywhere projection display that incorporates characteristics of the human visual system / Challenge to guaranteeing accuracy of reconstructed three-dimensional images / Reproducing an‘appearance’with a new viewpoint / Japan-France informatics collaboration research begins / Do You Open Your Mobile While You're Walking? 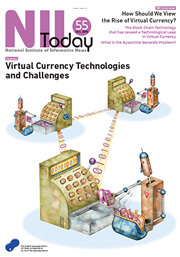 Betting on the Quantum Computer, a Unique Approach to Quantum Computing / The Mysterious World of Quantum Mechanics Heralds the Future of Information Processing / The NII Quantum Information Science Theory Group: The Global Standard in Theory / Is the Science of Statistics a Sin? Coping with the Multifaceted Character of Universities: Establishing Information Security Policies / For Safety and Security in the Network Society / The Role of Copyrights in an Era When Anybody Can Be a Creator/ The UPKI Project : Protecting the Information which Universities provide to the internet /“Meaning”? What Does it Mean? The Genome as the Keystone of Integration: Merging Life Science and Informatics / CREATING FUSION FROM TRANSDISCIPLINARY / The New Value in Information Linkage / Building a Proud Heritage: NII Graduate Education / What is name identification?